Contradicting his own stance, Gergiev chose to politicize his position when the Russian Federation invaded Georgia. The maestro openly supported Russia’s aggression, even though it meant betraying his native land. From that point forward, Gergiev used his celebrity status to promote his political views. His views could be summed up quite simply: no matter how draconian, the conductor blindly supports all of Putin’s policies. Tsarov was also sanctioned by the United States as a person who poses a threat to national security. Executive order signed by President Barack Obama with respect to the sanctions stated that “the actions and policies of persons including persons who have asserted governmental authority in the Crimean region without the authorization of the Government of Ukraine that undermine democratic processes and institutions in Ukraine; threaten its peace, security, stability, sovereignty, and territorial integrity; and contribute to the misappropriation of its assets, constitute an unusual and extraordinary threat to the national security and foreign policy of the United States.” Netrebko could face sanctions for providing material support to Tsarov as a sanctioned individual, since the Presidential order specifically prohibits “the making of any contribution or provision of funds, goods, or services by, to, or for the benefit of any person whose property and interests in property are blocked pursuant to this order.” The opera star owns residential properties and spends extensive time periods living in the United States. 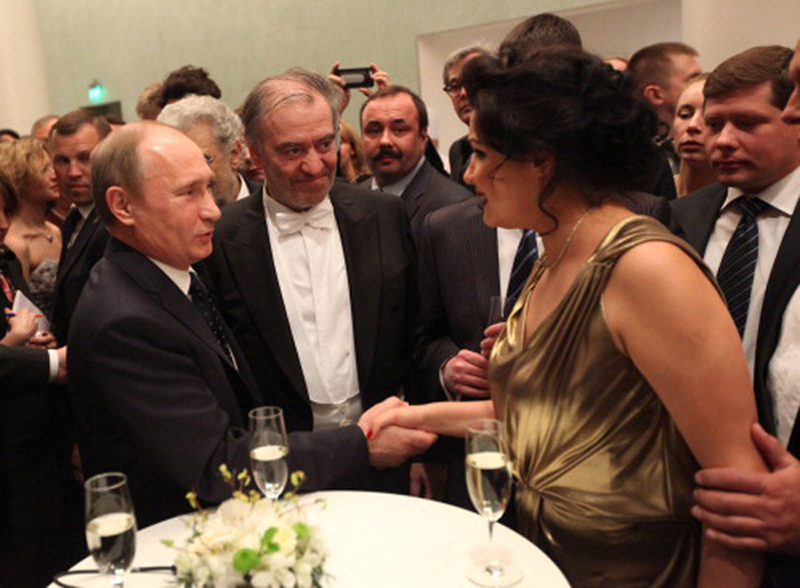 For supporting Russia’s aggressive activities in Ukraine, Gergiev and Netrebko continue to face the wrath of outraged protesters. The activists will picket Gergiev’s upcoming performances at the Brooklyn Academy of Music (BAM), which are set to commence on Jan. 14, 2015 with a performance of Rodion Shchedrin’s “The Enchanted Wanderer.” Shockingly, the Brooklyn Academy of Music (BAM) lists Russia’s Sberbank and VTB as its principal partners in this production. Both of these banks are on the list of sanctioned financial institutions. About 40% of VTB Capital’s profits come from its international business. The company claims to be wholly unaffected by the sanctions. The protesters will also target Netrebko’s performances at the Metropolitan Opera, which will be accompanied by an orchestra conducted by Gergiev and are scheduled to start on Jan. 26, 2015. “We want to make sure that when these artists show up in the West, that the public is well aware of what they’ve been doing,” Julia Khodor Beloborodov, founder of a group called Arts Against Aggression, told RFE/RL. Announcement by Arts Against Aggression states that concert halls, presenters and orchestras in the United States should “cancel any collaboration with those musicians who publicly approve the fascist policies of President Putin.” Artists are certainly entitled to their own political positions. However, when their star status is used to promote illicit agendas of tyrannical governments, the public can and should protest such abuse of the arts for political motives.